ot so long ago, if you stepped out of the house in a tee it would be the equivalent of walking around Walmart in your undies today. They were considered an undergarment and gradually progressed into something known as a bachelor shirt. They were easy to take off with no awkward fastenings. New fashions surrounded it, giving us things like Pocket T-Shirts for men that would be worn all the time. Thankfully, they’re now accepted in the public eye. If they weren’t we would be missing out on some quality and stylish designs that enhance your fashion game. Admittedly, many of us guys need a little help when it comes to picking out clothes and that’s where Men’s Gear can step in. Our well-dressed team has been picking out the best pocket t-shirts for men on the market today. We’ve actually rounded up 26 awesome pocket tees to help subtle styles and outlandish outfitters find a t-shirt to match their tastes. Before we get into it, let’s answer some common pocket-tee FAQs! What Are The Main Things To Consider Before Buying Any Pocket T-Shirts For Men? 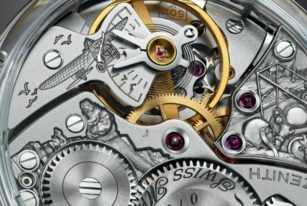 Before tiring your index finger out and scrolling manically through the 26 pocket t-shirts for men lined up for you below, take a moment to consider a few things. There are a few considerations you need to think about before buying a pocket tee and we’d like to bring your attention to them from the start. Think of the reason you’re buying a pocket t-shirt. Pocket tees can cater for casual events such as days at the beach, adventures in the mountains, or sun-drenched afternoons spent at your local bar. Most are aimed at these sorts of occasions and have a casual feel to them. However, you can still find pocket t-shirts for men that wouldn’t look out of place at a slightly more formal event. Even places and periods of time like as in a fancy restaurant, meeting the in-laws, or going to the theater. You can even get pocket tees designed for outdoor workforces. If you’re using them as part of work gear then you may need the pocket to store a pencil or other useful accessory, like as a tape measure. The dimensions of the pocket and how it’s fastened will be important. Some people, however, may prefer the pocket aesthetic rather than its function. These people could even choose a pocket tee with an artificial pocket that doesn’t even open. Which one are you? A third and final decision we consider as a major key before doing your pocket t-shirt shopping is the type of fitting you want. Many men now like the slim fit that highlights the hours spent in the gym with sleeves that hug biceps tightly. Other men may prefer the more relaxed surfer-type appearance. They may even need a relaxed fitting to aid mobility during outdoor pursuits and work-related tasks. What Clothes Do Pocket T-shirts For Men Go With? Most men aren’t great at thinking ahead when buying new clothes – not as forward thinking as our girlfriends and wives at least. At some point, we’ve all been the guy with the expensive new item that doesn’t match up with anything in our closet. 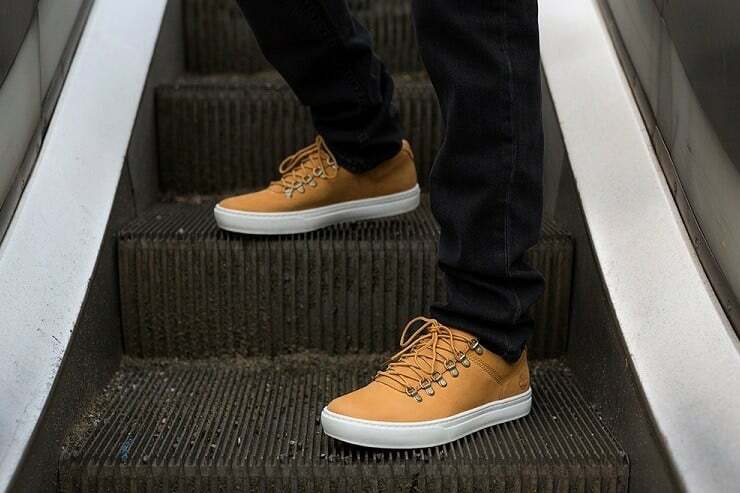 We’re dudes after all and often think of function more than fashion itself. Thankfully, pocket tees aren’t that difficult to match with other clothes and there are some simple rules to follow. 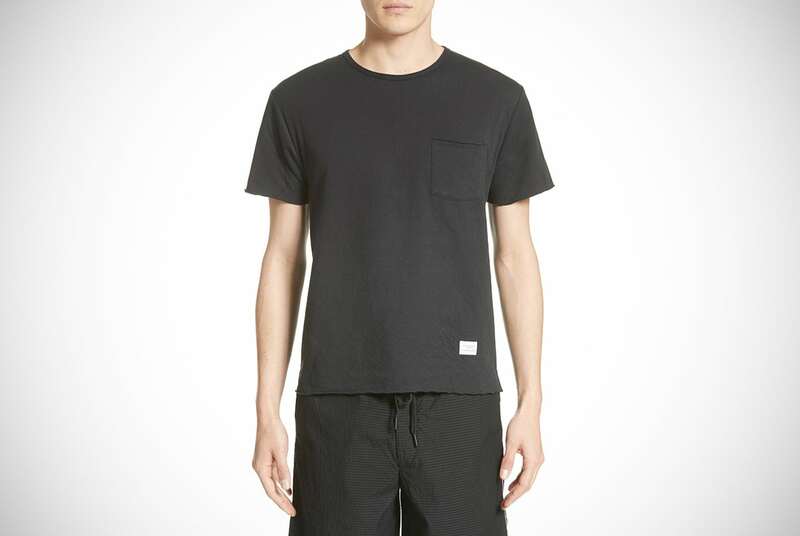 Some pocket t-shirts for men don’t contrast the tee itself with the pocket. The color of the whole garment remains the same throughout. From a distance, you may not even recognize the pocket at all. These are the easiest tees to incorporate into your current clothes. Simply add your monotone pocket tee with most casual items and you’ll be fine. In these instances, the only thing to think about is colors. If you’re unsure, always stick with two colors and no more. You’re not a traffic light, Fred! It’s a slightly different story when it comes to pocket tees that contrast the pocket with the rest of the tee. This due to the same rule just mentioned. Some of these pockets can really stand out and look like they’ve been cut and pasted from shirts of completely different styles. In these cases, we recommend you use the contrast to your advantage. Play on the color of the pocket to match it with other items or accessories. For example, having a brown pocket on a white tee with a brown belt or brown leather watch strap is a killer combination. Following the style and color of the pocket makes outfit planning much easier, but it may also make your other clothing searches more niche. Any Risk Of Pocket T-Shirts For Men Going Out Of Fashion Soon? Blink and you may just miss a 21st-century fashion trend. Our current styles are changing at a speed much faster than previously witnessed. However, the upper half of our body has stayed clear of the swift changes for the most part. It’s our jeans, skinny jeans, chinos, and various other legwear that’s seen the brunt of the fashion hurricane. At least, they are most often the things we see go down the quickest and easiest. 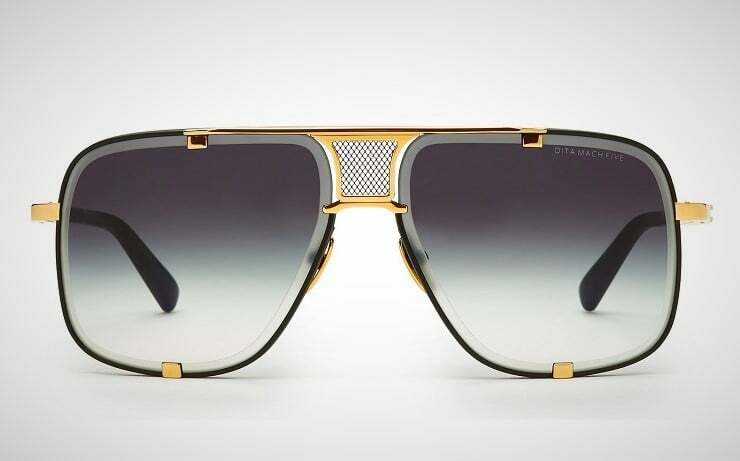 Of course, this leaves unstylish men in its wake. Some of us may not even get in on the trend until its last days. Most types of pocket t-shirts for men have sought shelter from these wind direction changes in the fashion industry. 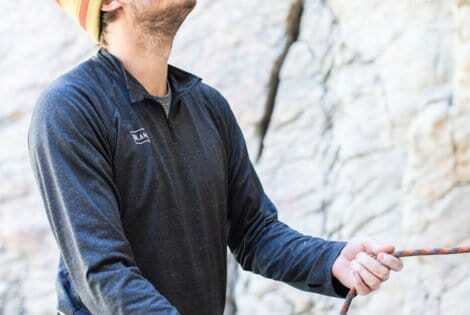 This is good news for pocket-tee lovers. These garments are here and they’re here to stay. While no one expects them to become iconic, the t-shirt itself has been a popular item for centuries now. It has become a staple by itself for decades. While women may not always see the same love for their shirts, like certain tank tops, men seem to escape fashion issues easier. This very well could be how the fashion world reacts to female clothing versus male types. It could also be the fact that women seem to care more about this world than men. It could be a mix of both or more. 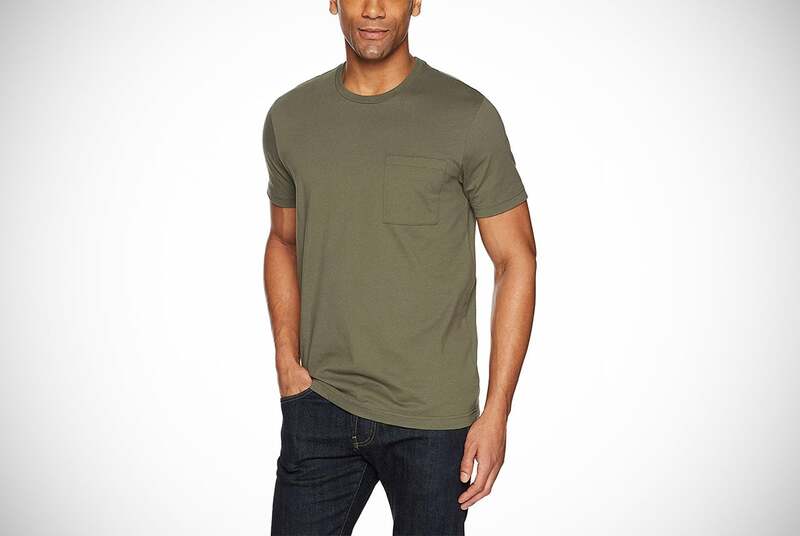 Regardless of why it’s pretty clear that pocket t-shirts for men will remain a popular thing for guys to go toward. Especially with paired with other items. First down the Men’s Gear pocket t-shirts for men catwalk is a brand who that is no stranger to the t-shirt scene. Especially when it involves men. They’ve been in the clothing industry for years. In that time, they made their name on male clothing. Of course, we’re talking about Calvin Klein. 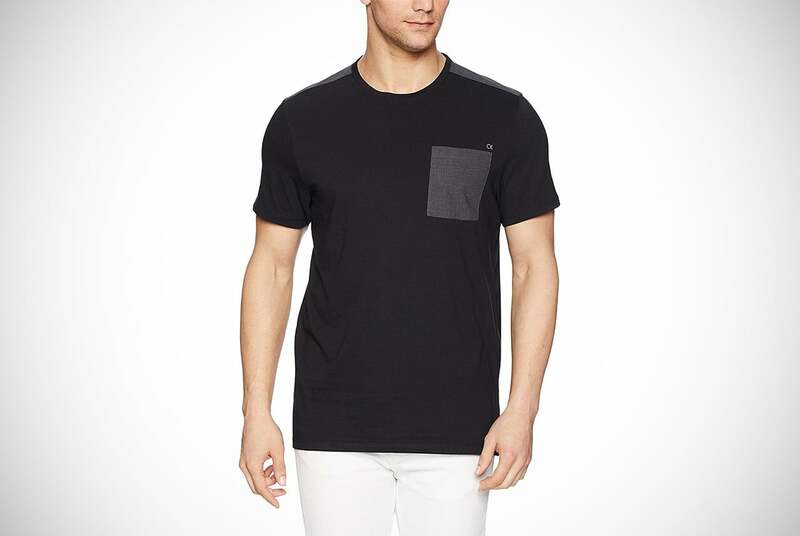 They have produced a pocket tee in a choice of black or white with gray trimmings in a regular fitting. 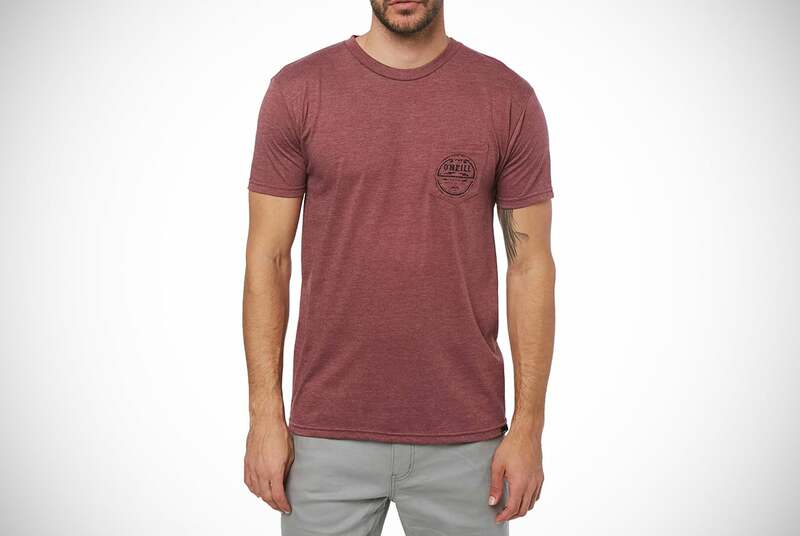 This tee is made from 100% cotton and very breathable which makes it perfect for the summer time. It could even be useful under a light jacket in the fall. The pocket on this machine-washable crewneck tee has the Calvin Klein branding above it to show off your sharp dress sense. This pocket is perfect for storing everyday items such as pens, iPods, headphones, or even your phone. Quicksilver may be a recognized brand and makers of impeccable clothing. However, we must make fun of their strange choice of color names. You can pick this pocket tee up in a choice of denim heather or a four-leaf clover. Confused? Don’t feel alone, we were a bit taken aback by them too! It’s predominantly made from polyester with short gray sleeves that match the color of their contrasting pocket. 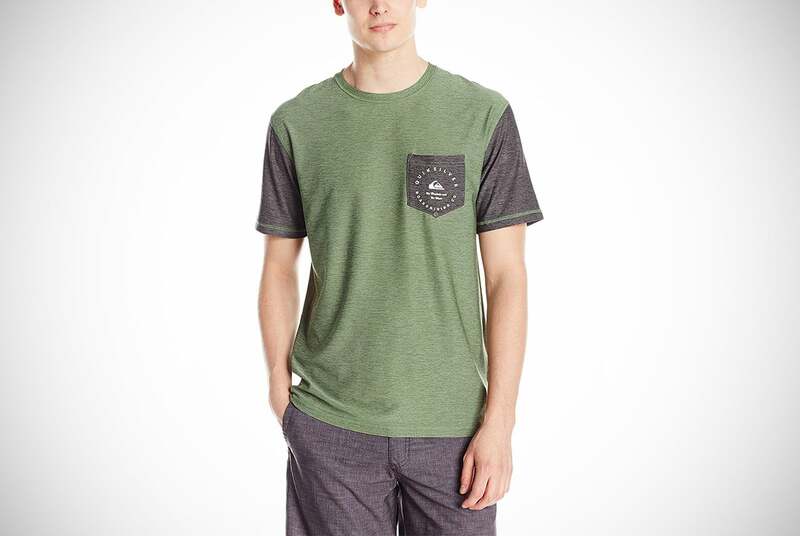 These pocket t-shirts for men have been decorated with the Quicksilver emblem. This allows you can show off your cool tee made by an awesome brand! Though this t-shirt will not make you a member of the X-Men, it’s at least nice that you can wear a great t-shirt. If you’re looking for a specific color or looking to buy a heap of pocket tees in different colors then Goodthreads have your back. In fact, you could get one of these phenomenal designs in a different color for every day of the week. You’d still have a spare one left over. These tees are made from 100% cotton and are machine washable for your convenience. Goodthreads have been careful when trying to make their pocket t-shirts for men as comfortable as possible. They did this in a few ways, the biggest being that they removed their tag from the collar. 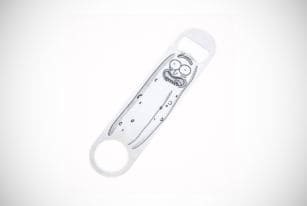 You can even get their designs without a pocket. Ya know, if you’re here and lost. Then there’s something for you as well. Did you come to our buyer guide with a slim-fit-vintage-indigo tee on your mind? One that included a bike print and contrasting pocket from Penguin? While that is a bit weird dude, we don’t know if you should be happy or shocked. Yet you’re in luck – that’s exactly what we have here. As mentioned, it’s a slim-fitted tee which is the height of fashion these days and will hug those tee-shirt muscles a little tighter. This may help you turn a few heads around the ladies…or men if you so desire. We aren’t judging. The stand out pocket creates an exceptional contrast to the rest of the top. It has a unique and quirky design to be proud of. Good job penguins! They only employ penguins, right? We’re not going to lie, these pocket t-shirts for men are pretty interesting. Even if they are made from semi-aquatic yet flightless birds native Antarctica. However, we kind of hope that they also have to wear work clothes and are currently wearing little pocket t-shirts for penguins. You know you were thinking it too! Who doesn’t like a bit of Levi’s in their male-style arsenal? They’re big players in the fashion industry and have produced exceptional pocket t-shirts for men, one of which you’ll see above. It’s not the only one you’ll discover on our list either! 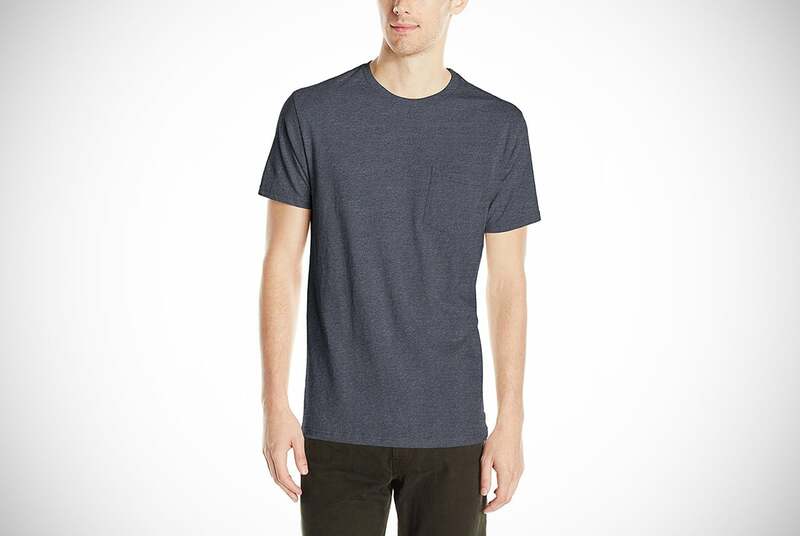 Levi’s don’t usually offer a vast amount of color options, but they’ve made an exception here as you can sling this tee on in five different colors. The pocket on this tee is at the opposite end of the spectrum to the tee we’ve just seen. The pocket is the same color as the tee, offering subtle class rather than a stand-out contrast. This composition of cotton and polyester craftsmanship is also machine washable for your convenience! Sticking with Levi’s, we wanted to send it over to their vintage department. 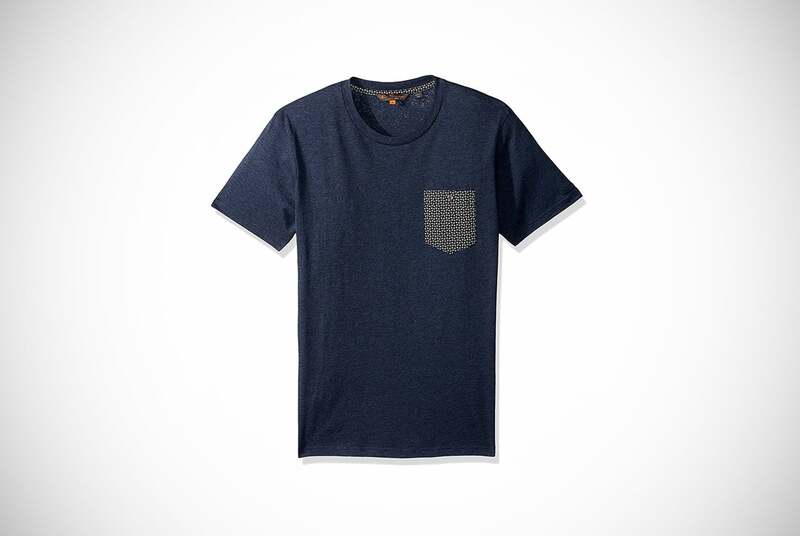 Here you’ll find phenomenal pocket t-shirts for men, exactly like the one you see above. Its vintage aspects can be seen in the extra short sleeves combined with the scooped crewneck. It has a touch of the modern though as this is a slim-fit design that we see sported in most cafés and bars in every cool district. Similar to their previous design, the pocket may go unnoticed. This is due to avoiding any contrast with the rest of the shirt. If you choose to upgrade your fashion game with this cotton garment just remember to dry it flat! Penguin pocket t-shirts for men to love in our showcase are back again is this lightweight and breathable design. It’s perfect for those warmer months. Penguin is really good at making their pocket tees contrast between the t-shirt and the pocket. Truly, this ethos hasn’t escaped them here either. The pocket aspect of the top is decorated in multiple colors of palm trees which stand out against the dark sapphire background of the tee. They add a dash of color to what would have been a subtle and under-the-radar garment. This is a slim-fit design with short sleeves and a crew neck. Its composition of polyester and cotton makes it easy to clean – just throw it in the washing machine! Why not prepare for your upcoming vacation with this summer-feel t-shirt? We’re full of household names in this buyer guide. Another name to add to our star-studded collection is Ben Sherman. 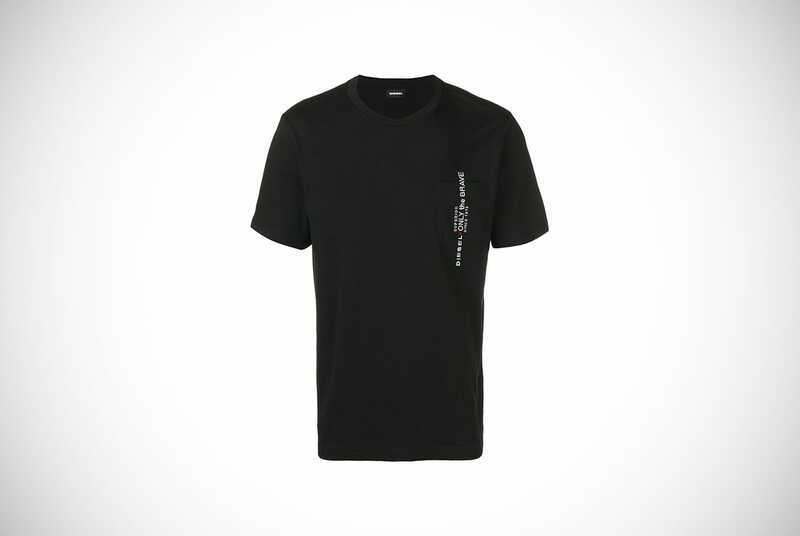 Their pocket t-shirts for men are definitely a locker room favorite here at Men’s Gear. It’s possibly one of the nicest pocket tees you’ll ever see. It’s made from 100% cotton and comes in a slim fitting to suit buff and trendy guys. 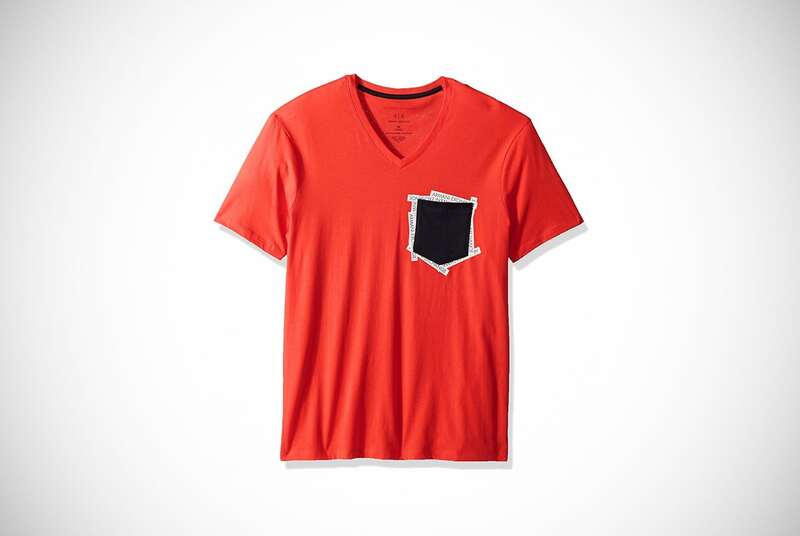 The coolest part of this machine-washable pocket tee is its pocket design. The designers over at Ben Sherman have gone for multiple arrows (or are they anchors?) facing in different directions. They then added a small button to the mix. These white arrows stand out on their indigo backdrop and will certainly catch the eye. O’Neill began as a simple beachwear brand in San Francisco. Now they have flourished into successful manufacturers of beach-to-mountain garments over the past 50-plus years. In this design, they’ve also gone for the short sleeve and crew neck aesthetics we’re becoming familiar with. They make this slim-fit pocket tee with almost an equal amount of polyester and cotton that enables it to be machine washable. These pocket t-shirts for men are easy to deal with, functional, and obviously, they look good too. To make their tee stand out and highlight their brand, they’ve added their own emblem to the patch pocket. They have replicated that emblem onto the back of the tee in much larger dimensions too. You can definitely trace beach heritage in this design. Back over to the renowned Calvin Klein with another of their authentic cotton designs. 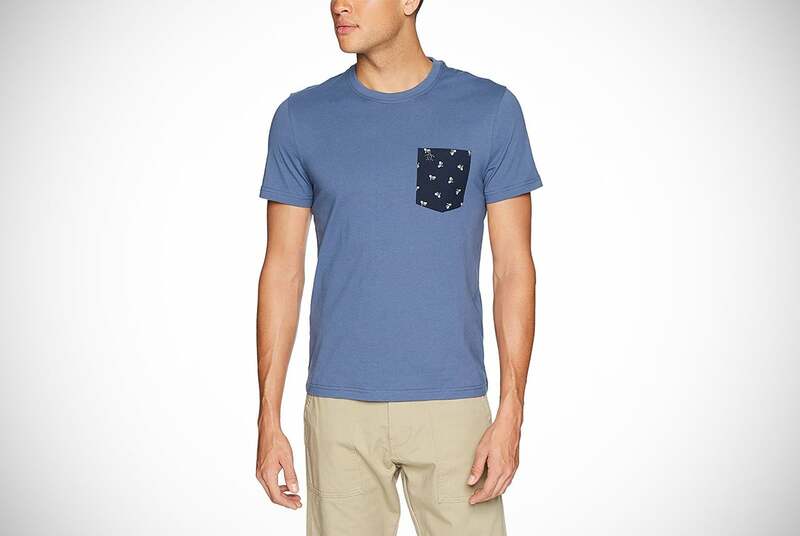 These are regular-fitting pocket t-shirts for men that will appeal to men who want a more relaxed look. Especially those who don’t want to look like the worst of the millennials in our generation. You know the type, the ones with their skin-hugging tees showing off their bicep-curl routines. No sir! These pocket t-shirts for men go the extra mile. They provide the right look while also still showing off the figure most guys have in a positive way. You do not have to be jacked to look good in this shirt, that’s for sure. Take that Dave! You can get this shirt in black, white, or Tunisian tile. All three colors will be contrasted with a gray pocket. Oh, and it’s machine washable too – what more do you want? Two? Apparently, Penguin hasn’t been making their clothes in the North Pole without opposable thumbs. They’re in fact an American company – who knew? Their story may be even cooler than our imagination though – read on! After an afternoon of drinking and a wrong turn in a Manhattan alley, a businessman drunkenly bought a drinking buddy in the form of a penguin from a taxidermist. On the flight home, the head of the penguin fell off. A flirty stewardess went on to tie her necktie around the penguin and the company’s logo was born. 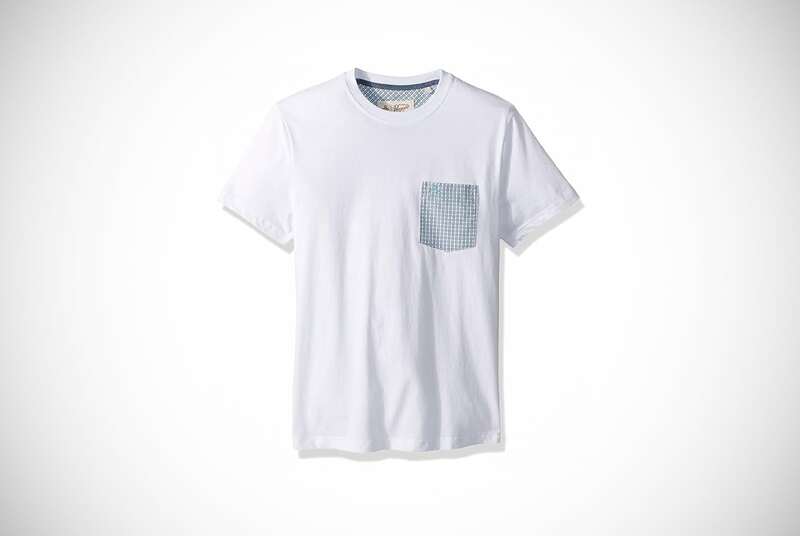 These cool pocket t-shirts for men are now part of their story and made from 100% cotton, as well as machine washable. Its single blue pocket contrast works well with the rest of the white top. This helps it to make a bold statement and an eye-catching tee. Vineyard Vines may be a more obscure answer at your bar’s quiz night than the likes of Levi’s and Calvin Klein. However, they can definitely make pocket t-shirts for men that keeps up with the big boys. The company was created by two brothers who enjoyed the simple and hardworking life at vineyards as youngsters. They went on to quit their Manhattan office jobs and started to sell ties so they no longer had to wear them. Now they’ve expanded their garments and offer quality items like these tremendous pocket t-shirts for men above. 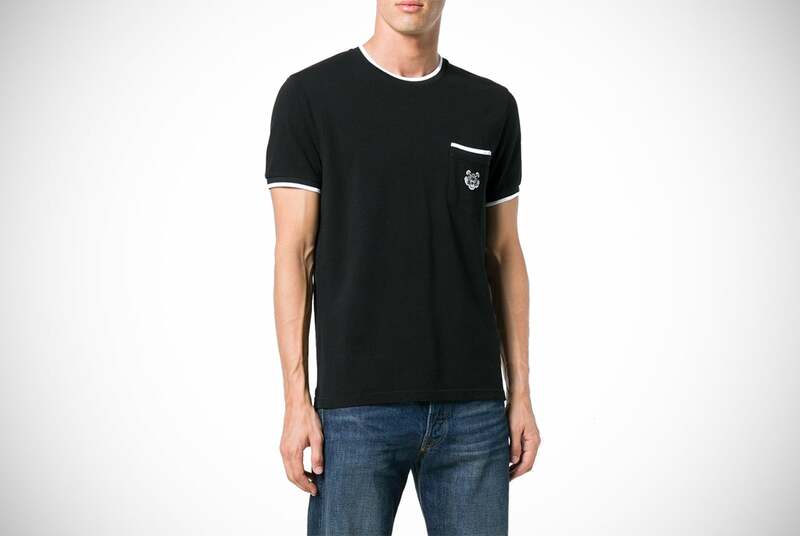 The tee itself is a regular fitting cotton product with short sleeves and a crew neckline. It has a unique design with the USA flag squashed inside of a whale – hence the name. This is then added to the breast pocket. It’s a quirky one which will sit well on the shoulders of any beach lover. This New York brand has created a black shirt with a black breast pocket. The monotone design hides the pocket from a distance and will be suited for guys who want a somewhat subtle style. We say “somewhat” because they have added the Rag & Bone tag. This is a trim fit tee with a crew neck and short sleeves. Its predominantly made of cotton and can be machine washed on cold spins. It can also be tumble dried on low heats. Pocket t-shirts for men, often times, seem to think they have to be crazy in design. Sometimes, you can be simple and minimal. It is often just as useful fashion-wise. Quicksilver has sped back in with yet another cool design that strays a little bit from their surfing heritage. 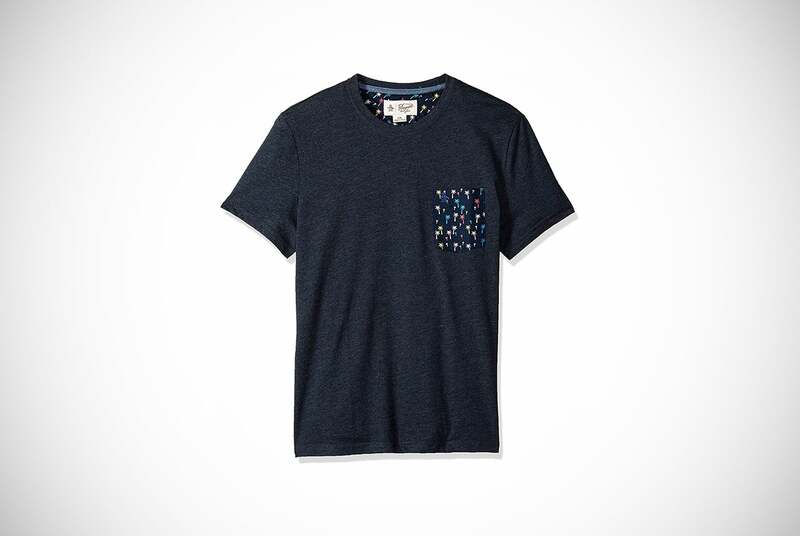 This regular-fitting tee and pocket have the same tapestry color – who knew tapestry was a color? Yet, it’s not a subtle design as the pocket has been given a pin-up-girl-type mural. The girl is sat in what looks like a wine barrel with a wine bottle in her hand as she floats down the river – maybe they didn’t stray too far from their surfing history, Anyway, definitely explains the name these pocket t-shirts for men decided to go with. This design is reprinted on the back of the shirt in larger dimensions as well! 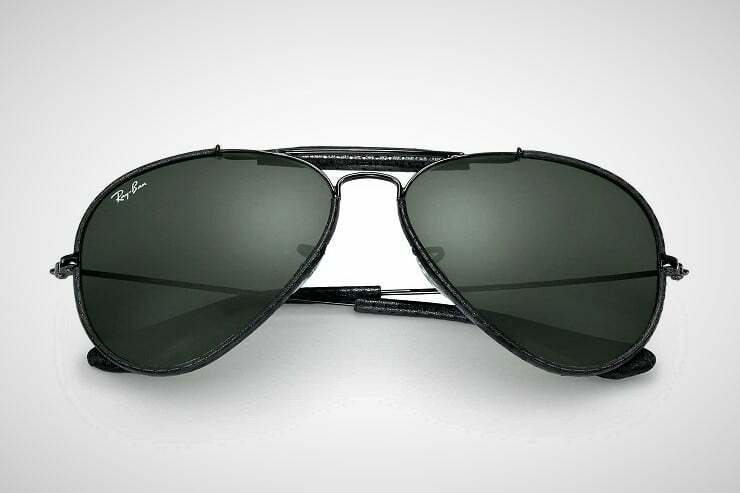 It’s definitely a cool and rebellious design we really like – rockstars join the line! 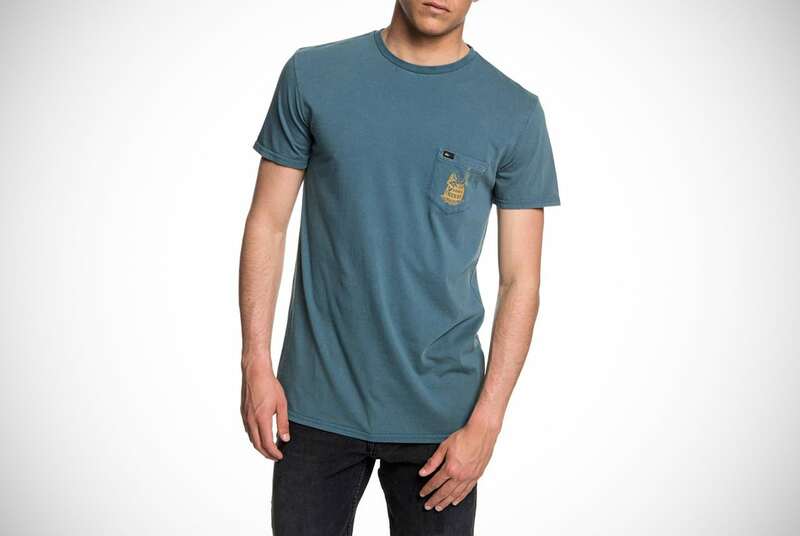 Next down our list are these Billabong pocket t-shirts for men that come available in five colors. We think Billabong are better at making tees than they are at naming colors. Clearly, some of them have some puzzling names. This is a wallet-friendly option and great if you want to grab more than one color t-shirt within a budget. The pocket on these t-shirts are subtlety hidden as each tee is monotone throughout. They’re even machine washable for extra convenience. Which color would you get? Another top label in fashion circles is the Ted Baker brand. Our list wouldn’t be complete without one of their exceptional pocket t-shirts for men. Simply put, they are known for doing these products right. 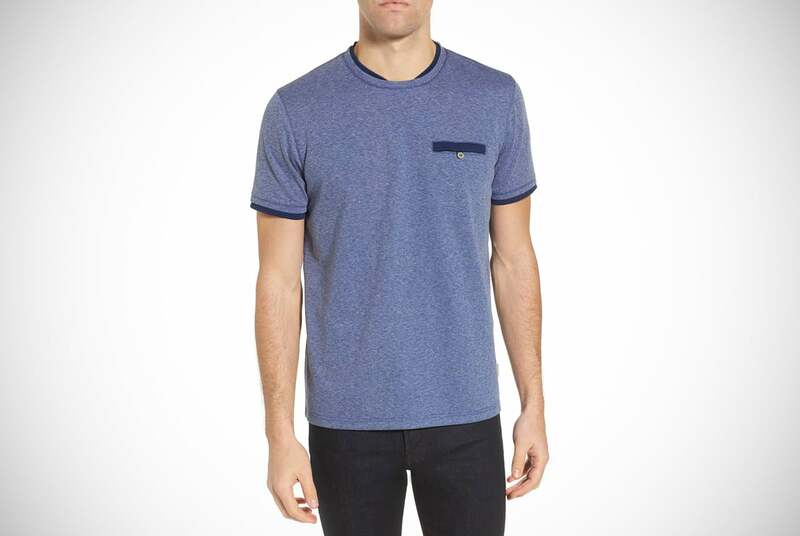 This blue design is a slim-fitting tee predominantly made from polyester. It’s ideal outside the summer months as it’s layered at the sleeves and at the crew neckline. These extra layers create darker trimmings along the seams which add to its awesome look. They’ve finished off the design nicely with a button-welt on the breast pocket. Interested? Billabong is known for having some quirky designs. They’ve certainly lived up to their reputation with these pocket t-shirts for men above. When you pick any of the three available colors you’ll get a different design on the pocket. However, all of these pockets are the same when it comes to quirky patterns. Ones that wouldn’t look out of place on a canvas in NYC’s Museum of Modern Art, for example. This really big contrast isn’t made on canvas. Rather, it uses 100% cotton that can be machine washable. We’d get the straw colored one – you? This Armani Exchange design isn’t going to be to every man’s taste, but it’ll certainly put a smile on the faces of a chunk of our readership. You can get one of these pocket t-shirts for men in navy or grenadine – the latter being what the cool kids are apparently calling red these days. Of course, you can also get more than one too. It’s a cotton tee with short sleeves that can be machine washed, but the pocket is for show only – it’s a false pocket! Alert Colonel Akbar, for IT’S A TRAP! In all reality, these pocket t-shirts for men have found their place simply due to the interesting look they have. The pocket graphic is only there to create a contrast. It does this shockingly on the red tee as the pocket is black, but the contrast can still be seen easily on the navy option. Why? Both designs have newspaper-like-cuttings of “Armani Exchange” spread around the false pocket to draw attention. An interesting design concept for sure. 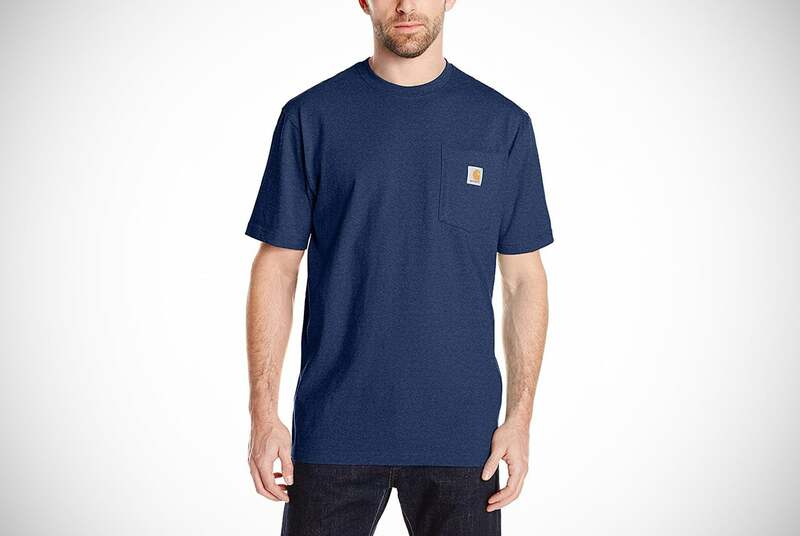 The impressive clothing brand of Carhartt offers many more colors to choose from than any other tee we have on our clothing racks. They make quality garments specifically for workwear and those that spend a lot of time outside. Each one of their 25 colors offers a monotone tee that doesn’t offer much contrast between the tee and its pocket. They have been made with an original fitting to give workers full mobility for operating machinery and working with tools. These are all tested on outdoor workers rather than labs to get real feedback This is also used so they can keep improving their designs. It’s not a bad thing to want to improve, especially when it comes to pocket t-shirts for men. It’s a growing market and figuring out what works best can always be a useful thing. Carhartt needs to be given credit for that, as well as their impressive t-shirt. 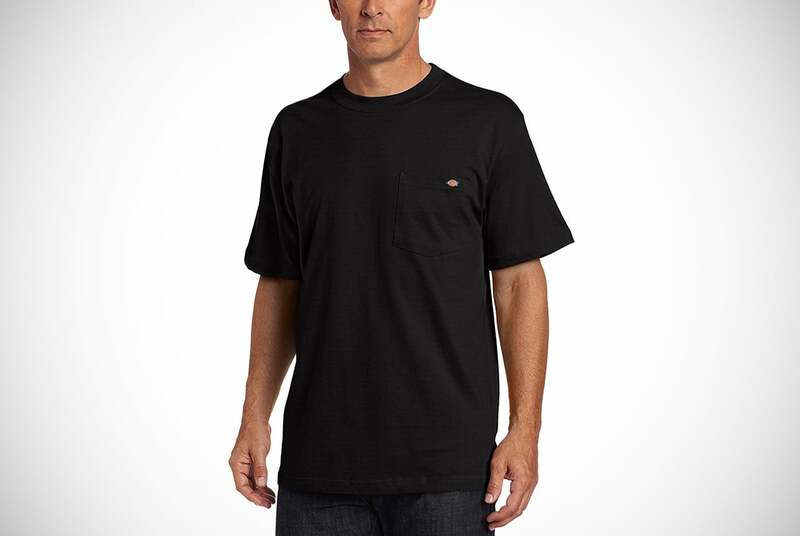 Dickies are an established brand in the United States that have grown around the world by the year. In fact, they were one of the companies employed to make uniforms for American soldiers during World War II. If they’re good enough for warzones, they’ll be reliable enough down the bar or taking on your buddies in a Nerf gun war. This practical background also explains the regular fitting provided by these pocket t-shirts for men. It’s clear they know how to design for the male figure, thus their t-shirts are perfectly put together. 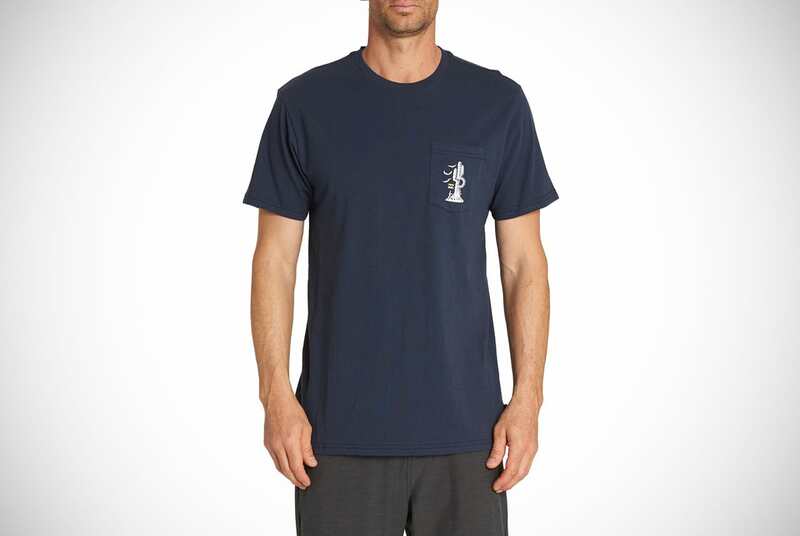 We recommend this pocket tee for outdoor workmen who need a pencil, eyeglasses, or a small device at the ready. Meanwhile, we’d also push for handymen and building site managers to get involved and grab one for themselves. Now you’ve been introduced to a few Billabong options, we thought it’s important to catch you up on their origins. They’re an Australian company that originally made triple-stitched shorts to tackle the likes of Byron Bay and Bondi Beach waves. They held up against these strong rips and have rolled out even more quality garments ever since. The pocket has an image of a cactus baking under the sun and the same cool designs are replicated on the back of the tee in much larger dimensions. 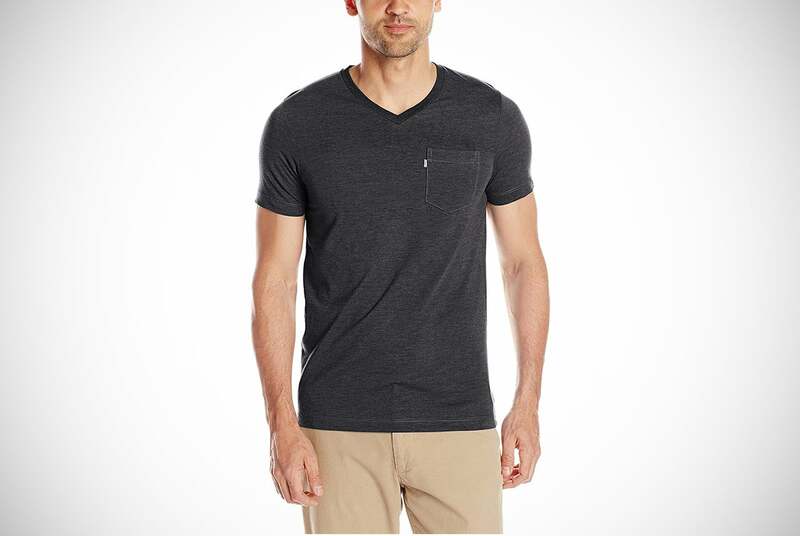 These are slim fit pocket t-shirts for men, with short sleeves and a crew neck. For your convenience, it can be machine washed. This is due to being made with 100% cotton. 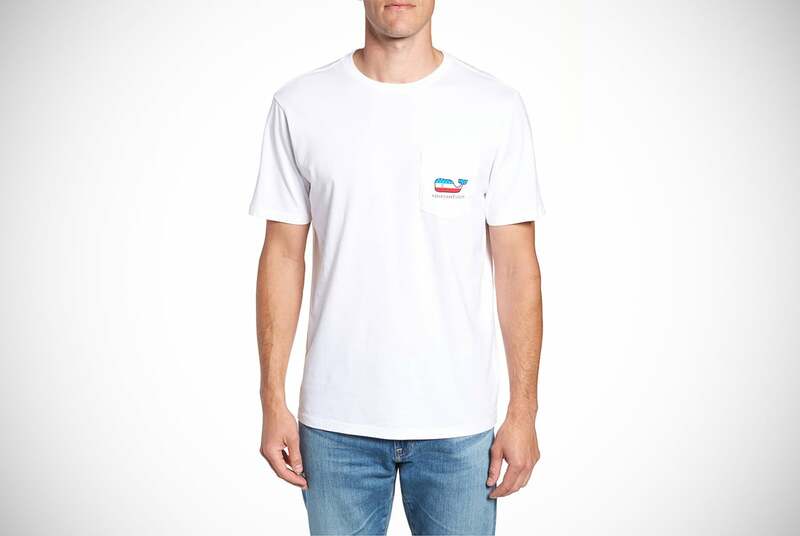 If you’re looking for a less-formal pocket tee then choose this one! 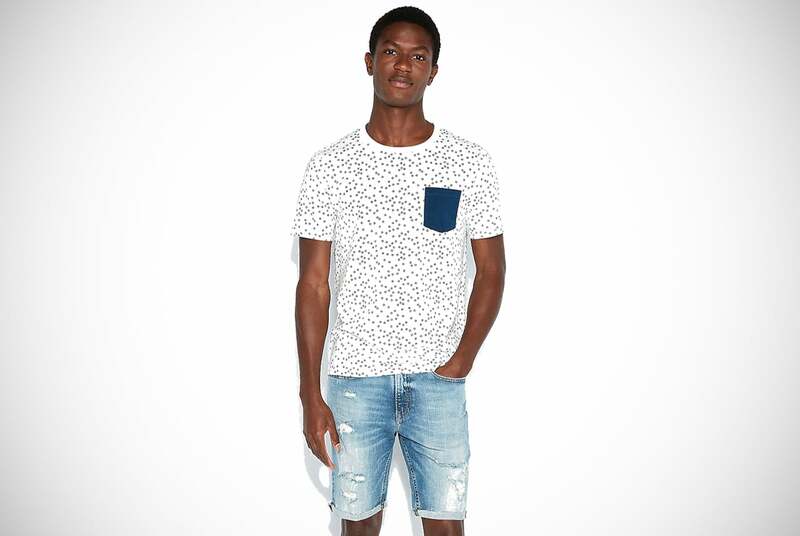 These pocket t-shirts for men out of Express come in an Ivory or sage color and have a floral print. The floral print isn’t like the one you cringe at in vacation photos from the 70s. However, it’s much subtler and from a distance, so much so you’d think it was just a dotted tee. The pockets on these tees heavily contrast with the rest of the shirt. It only adds to their quirky and standout aesthetics. It has short sleeves and is made entirely from cotton like a lot of other designs, but it does offer something unique. it comes in dimensions for tall men. If you’re a tall guy and are constantly trying tees on and revealing your belly button, then the guys at Express have saved you from the hand-me-down look. Kenzo may not be on your radar but you won’t forget them quickly after having a look at their masculine pocket-tee design. This short-sleeved black shirt, masquerading under the fancy color term of 99 Noir, is made completely of cotton and has a round neck. A lot of the pocket t-shirts for men we’ve shown you so far have had crew necks. There’s something to be said for round-neck appreciators. This is why we loved this design, as it gave us a variety we craved. The tee’s sleeve hem and pocket lip have a white trimming that frames the tee well. The pocket has been added with an image of a tiger. This is predominantly beige colored with a white outline to match the hem. 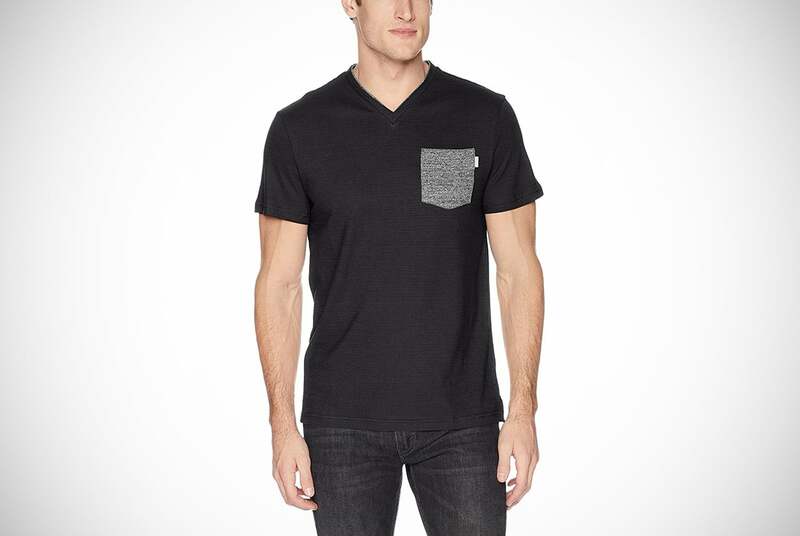 The design here offers a quality black pocket tee and would make a fantastic gift for any man. Winner of the classiest pocket t-shirts for men may just well go to this Calvin Klein with this design. The striped tee imitates designs often found on a quality button-down formal shirt and oozes sharpness. The stripes won’t just make you appear taller, they also provide a contrast. 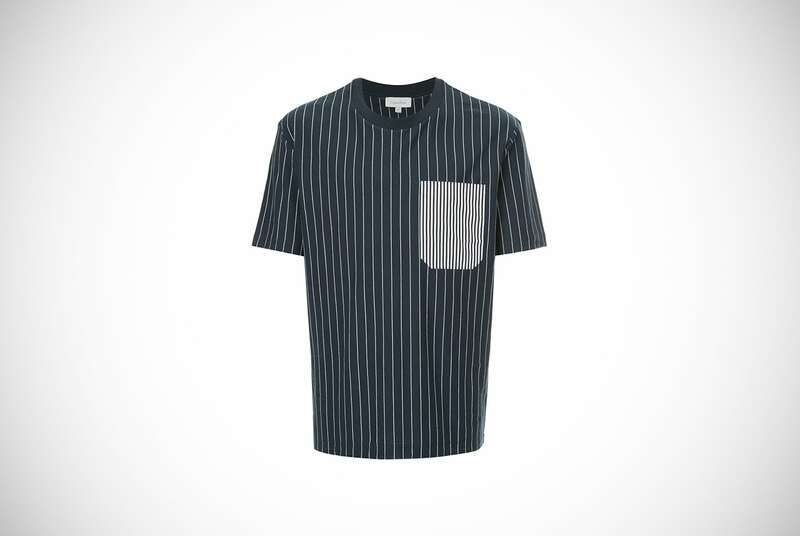 The stripes switch colors from tee to pocket to give the t-shirt a coherent but distinct aesthetic. An interesting note to pay attention to. The fashion model showcasing this t-shirt above is a little over six foot tall and only wearing a size medium. That said, this is another pocket t-shirt great for taller guys. Suddenly got a craving for skittles? This Levi’s tee is definitely breaking their mold as it’s exceptionally colorful. 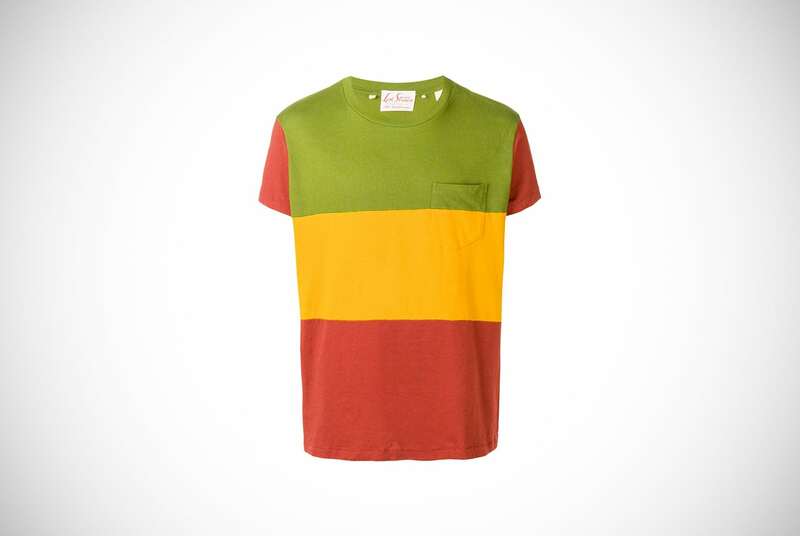 It has three block colors that resemble a traffic light system and is another one for round-neck fans. The breast pocket crosses the yellow and green panels. The pocket simultaneously changes colors at the same point to help it go unnoticed. These are simply quality pocket t-shirts for men, which happen to be made from 100% cotton. They would certainly add to the summer vibes! However, they could also brighten up a Fall or Winter period. Especially in warmer climates or on the inside for places like parties or visits to a bar. Last up is these pocket t-shirts for men that come from a brand that definitely won’t be news to you. Diesel is an established and celebrated label in the fashion world. Owning one of their pocket tees will certainly make you stand out, simply due to quality, they are made with alone. A good secondary is that they tend to look really great. Can we really not love the style of the shirt above? It’s awesome, something we’ve come to expect from the Diesel brand at this point. It turns out they make tees as good as their jeans. 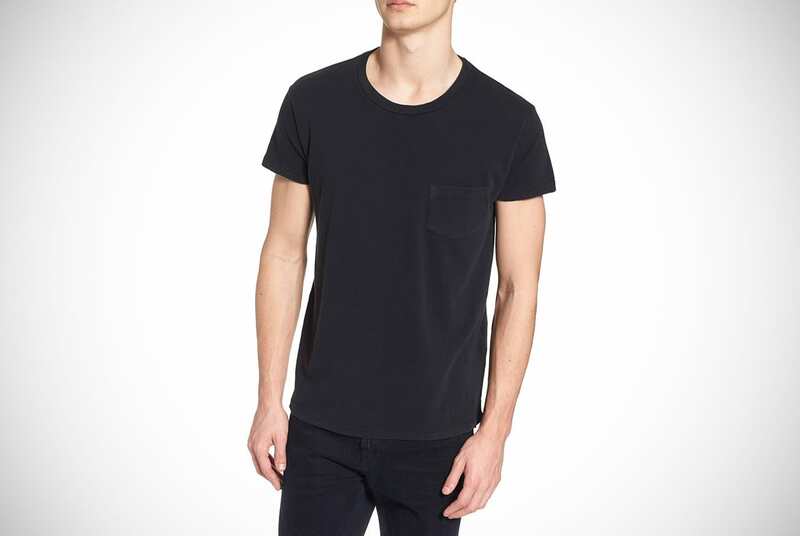 This black pocket tee hides its pocket by continuing the monotone black aesthetics. Yet, attention is drawn to it as the Diesel slogan is pasted across the upper left breast in white. We suppose if you own a diesel garment you’ll want people to know about it, so why not? 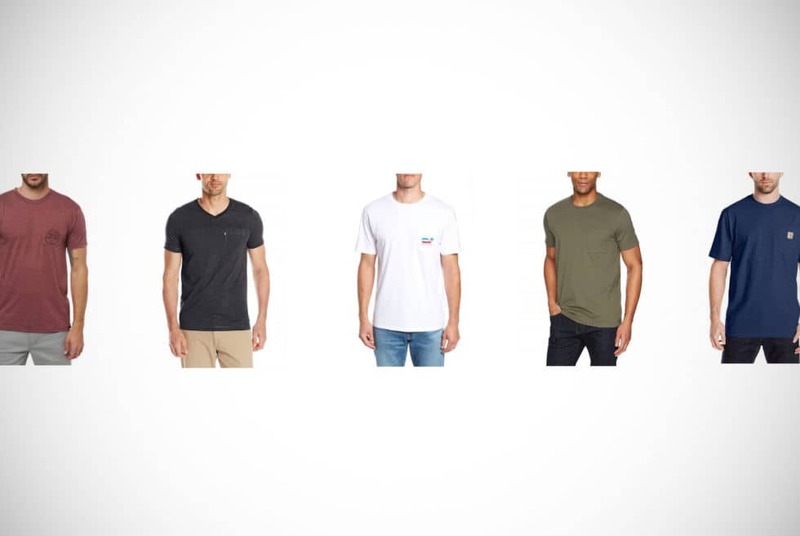 With the likes of Levi’s, Calvin Klein, Penguin, and many more established fashion labels on our list you can be sure that these pocket t-shirts for men will raise your style game. Our final words of advice are to look for designs you know you’ll feel comfortable in. Especially look for ones that you can easily pair with your current clothing – unless you’re aiming to completely transform your look! Also make sure you check accompanying size guides because brands tend to significantly disagree on what constitutes those S, M, and L tags. This is especially true with brands that differ in nations. Sizing in the United States, for example, won’t exactly be the same for The UK and Australia. This usually is an issue for women’s clothing but it can affect men more than you think. The same can be said for ANY Asian brand you might try. The pocket t-shirts for men may no longer be called bachelor shirts anymore. However, with one of our 26 head-turning pocket t-shirts for men, you might just earn that status once again!